Drytac has announced the global availability of WipeErase Clear overlaminating film for the creation of bespoke dry-erase boards. Drytac WipeErase Clear is a 3mil/75µ durable clear PET film with a gloss, hard coat finish and pressure-sensitive acrylic adhesive. Compatible with solvent, UV and latex printing technologies, WipeErase Clear enables users to quickly and easily create custom-printed, removable, high quality, dry erase graphics that stick to virtually any smooth surface. Importantly, it can also be cleanly removed. Applications include dry erase or planning boards, menu boards, signage, conference room walls, retail displays and much more. WipeErase Clear also possesses excellent anti-graffiti qualities, as well as resistance to scratches, abrasions, water, solvents, stains and chemicals. This full chemical- and scratch-resistance prevents ghosting, and the premium dry erase laminate means even permanent marker can be quickly and easily removed with the use of rubbing alcohol. Thanks to its wipe-clean laminate, WipeErase Clear is also ideal for the protection of printed graphics within environments such as children’s bedrooms, education establishments, day-care centres and hospitals, as well as grocery stores, restaurants and pubs. 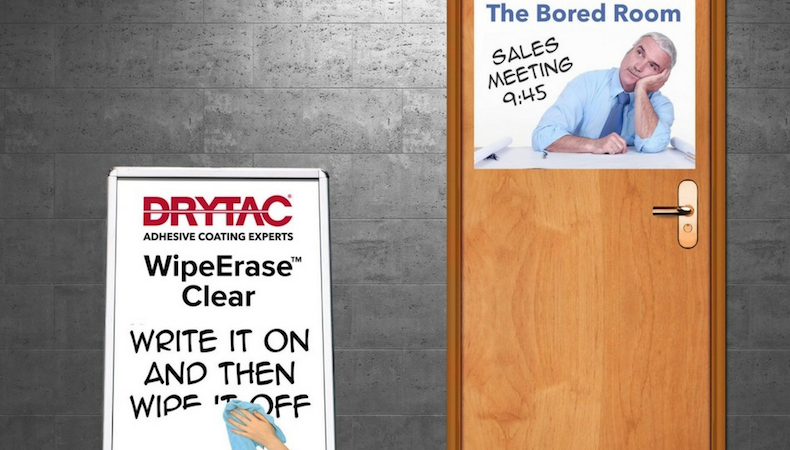 “WipeErase Clear enables users to turn any graphic into a dry erase board, and its applications are nearly endless," commented Drytac global product manager Shaun Holdom.